However, there is a place not known by many, a secret, a hidden gem in the midst of South Africa in the beauty of the Zulu Kingdom of KwaZulu-Natal. A stone throw away from one of the most amazing mountain ranges in the world, the Drakensberg Mountain, and surrounded by the tranquility and peacefulness of green hills, untouched landscapes and beautifully maintained gardens of Hartford House at Summerhill Stud. Anyone who visits, knows it is much more than just good conversation, fine wine and classic horses. The entire experience is a combination of smell, see and touch that prickles all of your senses to notify you, that this is the true meaning of ultimate luxury. In its own natural way it fits in with the surroundings and holds on to the heritage of the foundation from where it comes from. Hartford's beauty was discovered by the Moor family some 130 years ago when the land was granted to them by Queen Victoria in the mid 1870's. This property, which was home to the family of Sir Frederick Moor, the last prime minister of the Colony of Natal, is now part of the greater Summerhill estate, the former domain of Colonel Richards, who served as Sir Frederick's deputy and as a senator in the first government of the Union of South Africa. The families' endeavours left their mark on what the Midlands of KwaZulu-Natal represents today. The walls of these time-honoured establishments tell some remarkable stories, but there is only one in that league that resides within the confines of a world-class stud farm. It is Hartford House, the home of which is South Africa's fabled Summerhill Stud, Champion Breeder of the last ten consecutive years, and renowned for its national top ten restaurant. You can feel the passion at Hartford restaurant. Any meal here reflects their obsession. With Head Chef, Jackie Cameron, in the kitchen and behind every dish till 2014, it is no wonder they have managed to be listed 5th on Eat Out Top Ten in South Africa in 2013 and the only restaurant in KwaZulu-Natal to do so. Her determination and experience was undeniable. To fill her big shoes, Constantijn Hahndiek is now Head Chef at Hartford House and is just as impressive keeping by the high standards set by Jackie. Dinner at Hartford is a spectacular affair, served in the grandeur of a timeless dining room, or in the candlelit splendour of one of Africa's great verandas. There might be nine other "Top Ten" restaurants in the nation, but only one claims the ambiance which accompanies Hartford's history and award-winning gardens. And if you're lucky enough to be there on a weekend, the country's number one dance troupe reminds you that Africa is the home of performing arts. Breakfasts are celebrations of the creative spirit, individual masterpieces inspired by the genius of local producers and the fresh pickings of their kitchen garden. Lunch is a festival of the senses, the colours, the scents and the lilting sounds of a place completely at peace with itself. Hartford offer much more than just a one-of-a-kind experience with their outstanding restaurant and the ultimate luxurious hotel. They also offer a range of activities to keep you occupied throughout your stay just to add to their exceptional service. As they are the only world-class hotel on a world-class racehorse stud in the world, they can offer you a personalised tour of Summerhill Stud which includes seeing the stallions of the Rulers of Dubai. Horse riding is among the favourite activities for visitors as you get to explore the beauty of the green valleys, free running rivers and mesmerizing views of the Zulu Kingdom. You can also test your skills with rod in hand trying to hook some of their trophy-sized trout or bass in their rivers and dams. The Hartford Wellness Centre offers a range of therapies, body treatments, holistic massages and facials to relax even more while enjoying your luxurious stay. Hartford offers personalised trips to the Battlefields, Drakensberg World Heritage Site, Giant's Castle, Lotheni, Injisuthi and Kamberg reserves, as well as the Weenen Game Reserve as additional activities for the adventurous and the historians. Hartford also have an impressive swimming pool, a tennis court, historic gardens and is in close proximity to quality golf courses for the sport fanatics. 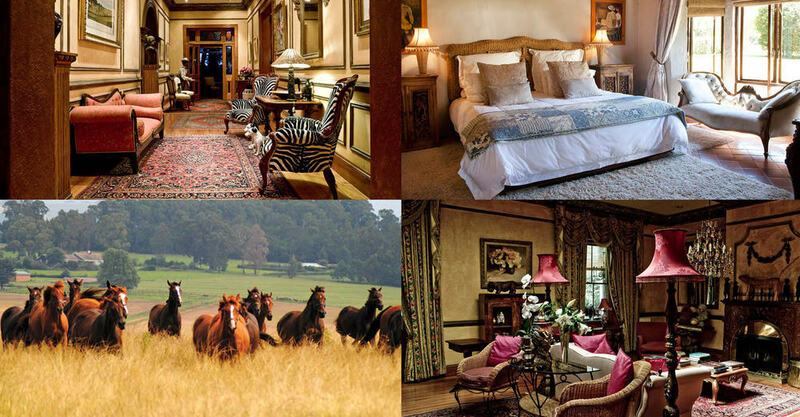 In all, visiting Hartford House is an experience one would never forget, an experience that would dwell in your memories as long as your feet roams the soil of our beautiful planet, looking for and comparing experiences that might match the unforgettable most luxurious memory of all in the heart of the Zulu Kingdom of South Africa.